How Can I Recognize My Hunger Signals? Many do not care to pay sufficient attention to their hunger signals. This is more common among individuals who undertake dieting or abstain from eating from time to time on a regular basis. Many do not care to pay sufficient attention to their hunger signals. This is more common among individuals who undertake dieting or abstain from eating from time to time on a regular basis. It gets difficult to recognize one’s hunger pangs since they may get suppressed or numbed due to chronic fasting or dieting. 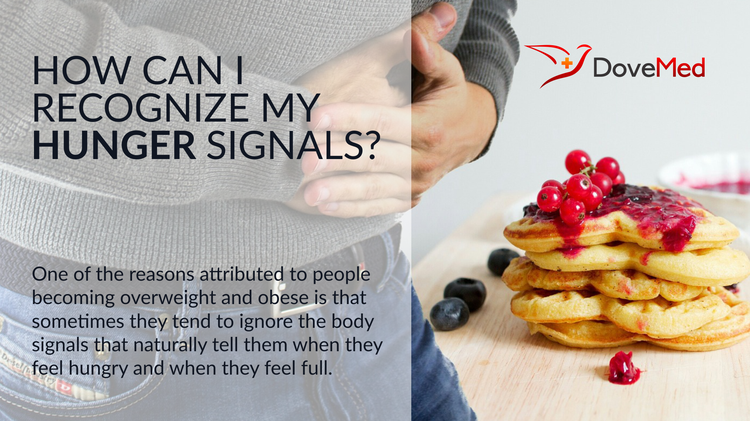 One of the reasons attributed to people becoming overweight and obese is that sometimes they tend to ignore the body signals that naturally tell them when they feel hungry and when they feel full. Below given is a fact sheet that consists of methods to recognize the hunger signals. If one eats when they are physically hungry, that is when they can manage their weight with ease. But, people tend to eat a lot of times when they are not actually hungry, which often happens due to boredom, stress, sadness, or happiness. You should be aware that the body may begin to provide signs of hunger 4-6 hours after you had a meal. The best way to identify hunger signals are to maintain a dairy and note down what one eats, when and what they were doing before eating. This food dairy might help one to notice their hunger patterns, and how often they eat. Maintaining a hunger scale is important to identify hunger cues. A scale of 1 to 10 for instance may be assigned with extreme hunger having a value of 10 and feeling full being assigned a value of 1. To note for hunger cues, after consumption of a meal, one needs to watch out for certain signs. These may include sensing an empty stomach, growling of the stomach, headache, feeling light-headed, grumpiness, lack of energy, shakiness, weakness and many more. Many a time, people tend to ignore or fail to recognize the pattern of these signs. One of the reasons why one ignores hunger signs may be because they are too busy to note them or just like to avoid them. Increased stress is one other factor that tends to make people forget meal timings and the quantity what they consume. If one adjusts the time of consumption of food by lowering or increasing the time between meals, the body mechanism can adjust itself by slowing down the metabolism. In the long run this can affect lipid levels of the body, making it hard for people to manage their weight. After consuming food for longer durations, it becomes difficult for obese individuals to get signals from their brains that tell them to stop eating, according to a research from Saint Louis University. Usually, a protein called leptin is released from fat cells and rides along the blood vessels that feed the brain. The protein then tells the body that it has had enough to eat, has eaten less or more. An increased body weight makes the communication between the body and the brain slower. Researchers at University of California, Los Angeles have also identified brain circuits involved in hunger that are influenced by the hormone leptin, which are the signals released by the fat cells. According to a research by the University of Washington, after consumption of lunch, the hunger signals actually stop. After that, consumption of food is due to other reasons and not ‘actual’ hunger in most cases. It is important to consume food only when there is a need for it. To tame one’s body according to ones hunger needs, one may start consuming small meals at regular intervals instead of large meals at a stretch. ERLANSON‐ALBERTSSON, C. H. A. R. L. O. T. T. E., & Zetterström, R. (2005). The global obesity epidemic: snacking and obesity may start with free meals during infant feeding. Acta paediatrica, 94(11), 1523-1531. Omura, D. T. (2008). C. elegans integrates food, stress, and hunger signals to coordinate motor activity (Doctoral dissertation, Massachusetts Institute of Technology). Ferrarelli, L. K. (2016). Hunger signals suppress risk perception. Sci. Signal., 9(458), ec292-ec292. Martelli, C., Pech, U., Kobbenbring, S., Pauls, D., Bahl, B., Sommer, M. V., ... & Luna, A. J. F. (2017). SIFamide translates hunger signals into appetitive and feeding behavior in Drosophila. Cell reports, 20(2), 464-478.